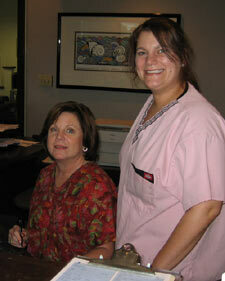 During your first visit to our office you will get the chance to meet our staff and your doctor. We have a couple of very simple forms for you to fill out and if you are filing insurance we will make a copy of your ID card. We will file any insurance for you as a courtesy. During a brief, free consultation with the doctor we will determine if we think we can help you. If we do believe we can help, we will follow with an examination of your spine and nervous system. X-rays may or may not be necessary, you and the doctor will decide. If your particular case is not complicated you may be treated on your first visit. If the doctor feels he needs more time to correlate your exam and/or your x-ray findings he may decide to wait until your second visit or another visit later in the same day to begin treatment. In either case, we will explain everything we find to you and answer all of your questions before we begin treatment. Your first visit usually takes about 30 minutes to 1 hour. Hattiesburg chiropractic patients appreciate that we explain everything in advance!